Left and right side hinged doors conceal one adjustable wood shelf behind each door. Surge suppressor with five electrical outlets, co-ax and phone jacks. Smart Eye® allows for remote control of concealed electronic components. Accommodates the optional Sligh® Strong Arm and Sligh® Smart Fan. 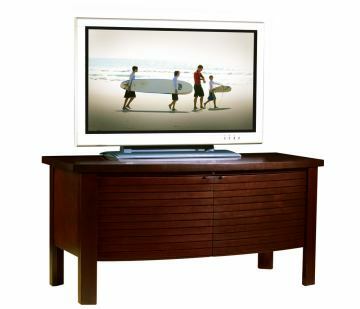 Bow front TV Console. Left and right side hinged doors conceal one adjustable wood shelf behind each door. Surge suppressor with five electrical outlets, co-ax and phone jacks. Smart Eye® allows for remote control of concealed electronic components. Accommodates the optional Sligh® Strong Arm and Sligh® Smart Fan.